While many retail stores have closed due to the current economy, Suni Kwang of Upscale Men’s Fashion continues to build for the future. Upscale Men’s Fashion was a gamble for Suni. In 2011, she owned 2 clothing stores: one in Garland, TX and one in Dallas, TX. Each store catered to a different demographic but both stores catered to low-income customers. When the recession hit, sales in both stores fell dramatically. Suni knew she had to do something. “Before financially touching bottom, I wanted to take a chance.” With 15 years of retail experience she decided to launch a new store. 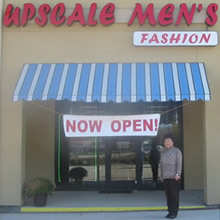 Upscale Men’s Fashion is in DeSoto, TX and Suni sees the potential for profits with a broad client base. Her new location is in a new retail center on a very busy street. Suni credits her business success to her retail experience and prudent use of credit. She has a credit line at her local bank and says, “It is very important to have good credit so you can get low rates from the bank.” Suni also has the entrepreneurial drive and optimism to survive the current economy and thrive when the economy recovers. Suni first came to the Best Southwest Small Business Development Center (SBDC) as a referral from the DeSoto Economic Development Corporation (EDC). The Best Southwest SBDC discussed various grants the EDC offers and the financials relating to the closing of two stores and the opening of a new store to target “upscale” customers. Suni continues to work with the SBDC utilizing their research on demographics, trends, customers and competitors in the DeSoto area. Upscale Men’s Fashion has a wide selection of suits at reasonable prices. They also carry a wide range of shirts, ties, shoes (including alligator shoes), hats (including Dobbs and Kangol) as well as various other men’s accessories.